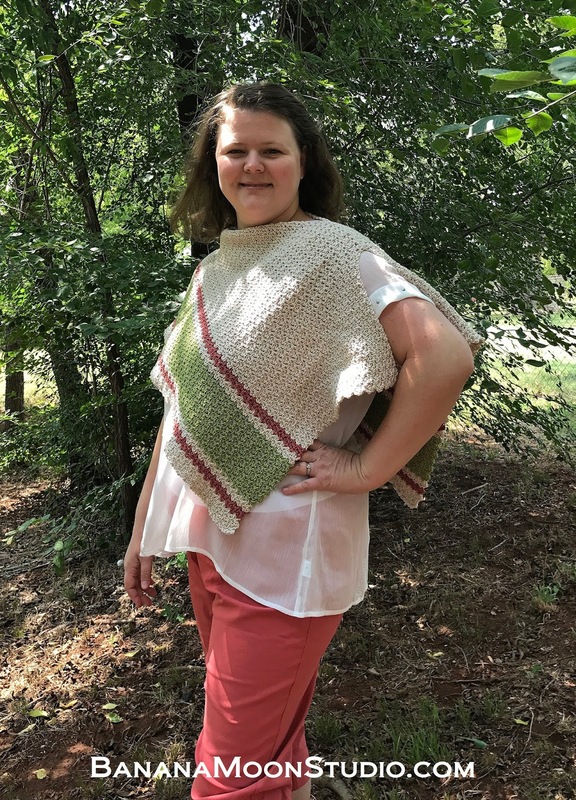 Today I have a free crochet pattern for you dear readers! 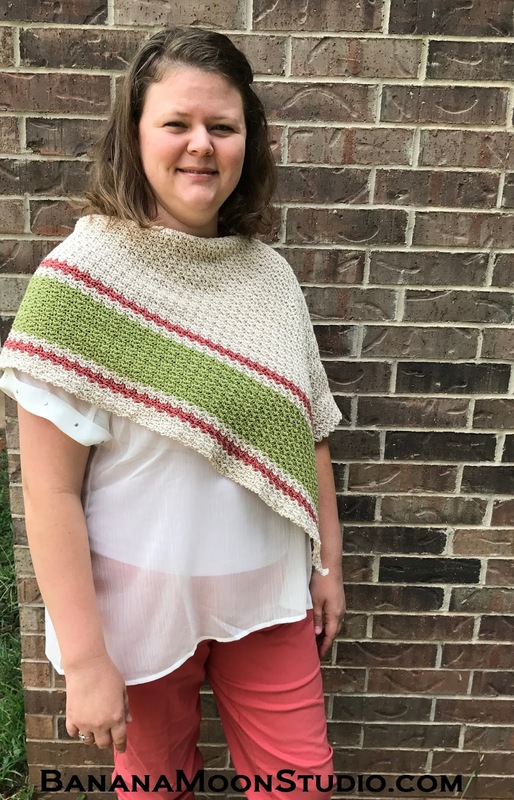 This is Patina Poncho, an easy crochet pattern for women. I’d say it’s for beginners, but not quite. It is made in a soft Pima cotton, so it has a really nice feel to it without being super warm. This women’s poncho is crocheted as a long rectangle, about 18 inches x 52 inches (or 45.5 cm x 132 cm). It begins on the bottom long edge, and works up from there. There is very little finishing to do. It is not edged. 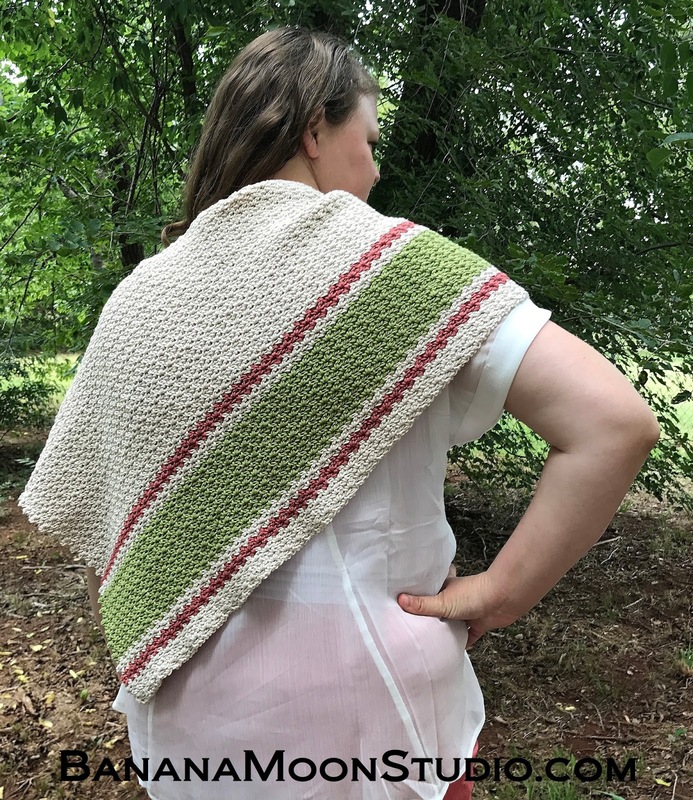 The only finishing is one small seam at one shoulder, which you can leave out if you prefer and just wear as a wrap with a shawl pin to close it. Finished Measurements About 18 inches x 52 inches or 45.5 cm x 132 cm. I used Berroco Pure Pima (100% Pima Cotton; 115 yds or 106 m; 1.75 oz or 50 g; Weight 3/light): 7 skeins #2203 Oyster, 1 skein #2230 Mellow Rose, 2 skeins #2217 Limelight, but this yarn has been discontinued. King Cole Cottonsoft DK: 4 skeins Ecru, 1 skein Rose Petal,1 skein Sage. Cloudborn Pima Cotton DK: 4 skeins Pearl, 1 skein Coral, 1skein Granny Smith. Crochet Hook H/8 (or 5 mm) and I/9 or (5.5 mm) hooks. Adjust hook size(s) if necessary to obtain gauge. Gauge 6 patt reps and 12 rows = 4 inches or 10 cm in Wattle stitch. To change colors, fasten off at end of last row before color change. With new color on hook, join with sl st in first ch sp, continue with instructions for Row 2, which are repeated for pattern. With off-white yarn and smaller hook, ch 254. Row 1(RS) With larger hook (Sc, ch 1, dc) in 2nd ch from hook (one patt rep made), *sk 2 chs, (sc, ch 1, dc) in next ch, repeat from * across, turn – 85 patt reps.
Row 2 Ch 1, sk first st, *(sc, ch 1, dc) in next ch sp**, sk 2 sts, repeat from * across, ending at **, turn. Repeat Row 2 for patt. Beginning with Row 1, work in pattern 4 rows of off-white..
Work 2 rows in red/pink. Work 2 rows in off-white. Work 12 rows in green. Work 34 rows in off-white. Fasten off. Fold wrap in half with RS together, lining up short edges. Begin at both edges, working toward fold, count 15 patt reps along top edge (the edge without the stripes). With off-white on hook, join with sl st through ch sps of 15th patt reps of both thicknesses. Working through both thicknesses, sl st in each set of ch sps and sts, working across 10 patt reps. This will make a seam along one shoulder. Weave in ends. Turn wrap RS out. Leave a comment with your thoughts! I’d love to know what you think of this design. What colors will you make it in? Who will you make it for? 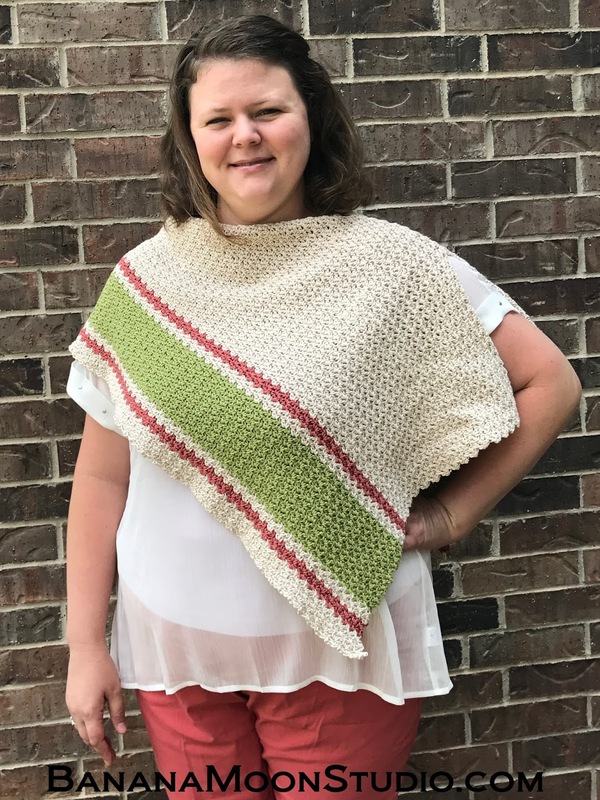 Willow Creek Wrap – Just $3 on Ravelry! 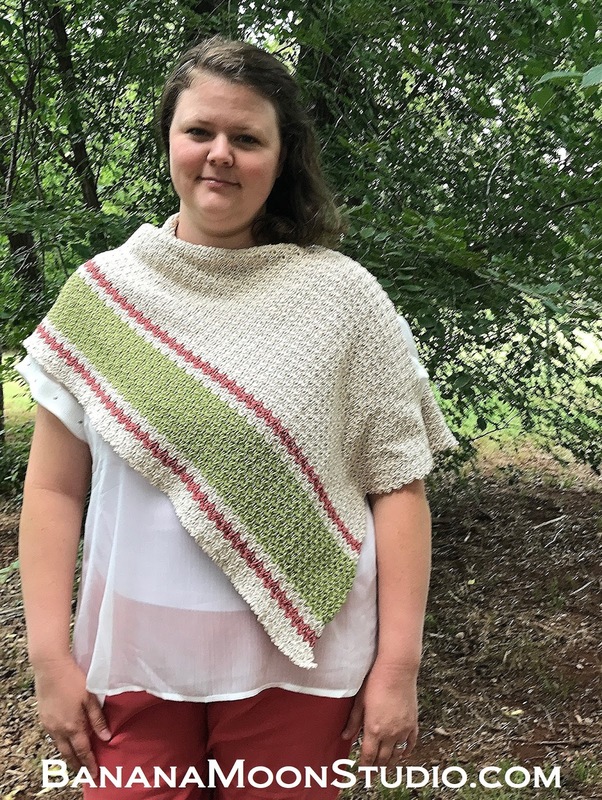 Get 2 FREE patterns along with a monthly discount when you subscribe! Previous postHow to Fix Broken Yarn When Spinning; It’s Easy! Bitte! Froh, dass Sie es mögen. Welche Farben werden Sie damit machen?